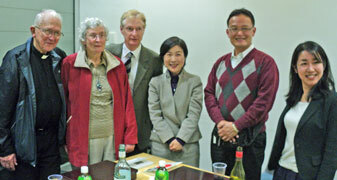 For the final session of its 2011 'Living Histories' interview series 2011, the Sydney-based Japan Foundation interviewed Marist author and former Japanese missionary, Fr Paul Glynn SM. 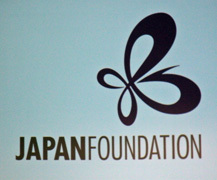 In the series former Tokyo correspondent, Ian McArthur, has interviewed Japanese and Australians who are shaping the relationship between the two countries. 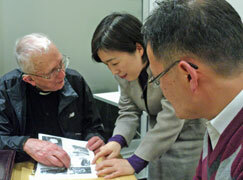 Many of the 50 people attending the Sep 28 session came through their association with Fr Paul, especially through his books on reconciliation with Japan. 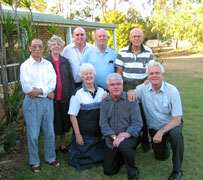 Fr Paul spoke of the beginnings of the Marist mission in Japan through the P.O.W. 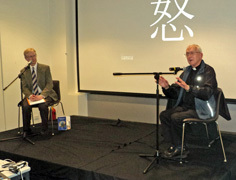 experiences and inspiration of Fr Lionel Marsden SM. Following a General Chapter decision in 2009, major superiors of all Marist provinces and mission districts have gathered in Rome for their second annual review beginning on Sep 23, the eve of the 175th anniversary of the first Marist professions in 1836. Present with the General Administration are: Frs Jacques Arguin (Canada), Hubert Bonnet- Eymard (Europe), Paul Cooney (Australia), Brian Cummings (New Zealand), José Maria da Silva (Brazil), Damien Diouf (Africa), Ted Keating (USA), Ben McKenna (Oceania), Larry Hermes Sabud (Philippines), and Jean Vienne (Mexico). General Assistant Alejandro Muñoz is also acting in his role as major superior of Peru-Venezuela. 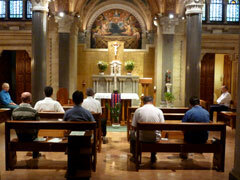 From left: ARC begins with the Eucharist in the chapel of the General House, Monteverde, Rome. 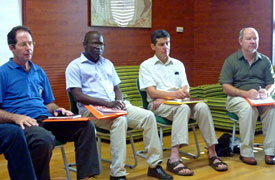 Two Australians are amongst the major superiors at ARC: far left, Fr Ben McKenna, provincial, Oceania. 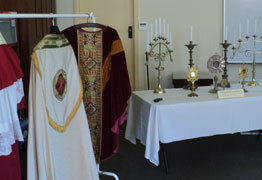 and far right, Fr Paul Cooney, provincial, Australia. Another Australian, Mr John Honner, is attending ARC prior to conducting an international survey of Marist structures and operations. On Sep 20 at Wairiki hospital, Taveuni, Fiji, Br Mua Saurava went to the Lord. 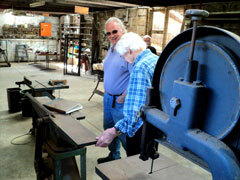 Planning continues for Villa Maria's 'Men's Shed' project. 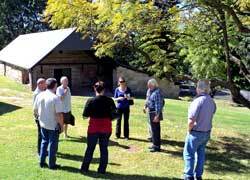 A meeting at the Hunters Hill site on Sep 21 took further steps in shaping an historic Marist building into a modern recreational facility for woodcraft and metal-working for local residents as Br Terry Garrett SM met with community and council representatives. 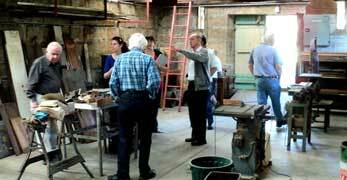 The 150-year old building has been a space for generations of Marists and their agricultural, mechanical and training activities. 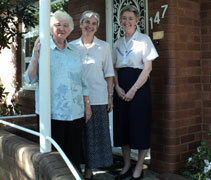 The Asia-Pacific leadership team of the Marist Sisters has moved from Auckland, NZ, to the western suburbs of Sydney. 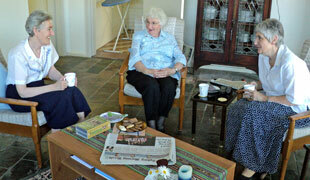 Regional leader, Sr Julie Brand SM, and her councillors, Srs Margaret Vaney SM and Vivienne Goldstein SM, are settling into their Hector St, Sefton, residence and regional centre. The Sisters' region of Asia-Pacific embraces the four country sectors of Australia, New Zealand, Fiji and the Philippines. 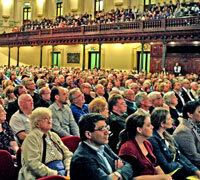 Marists were amongst the overflow crowd at Sydney Town Hall on Sep 15 for the launching assembly of the Sydney Alliance. 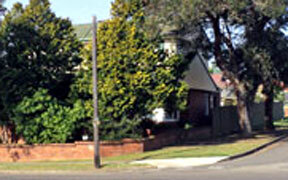 The Alliance's catch-cry, 'The way to have your say', hung from flags flying in Gerioge St, Sydney, as the assembly began after four years of preparation. 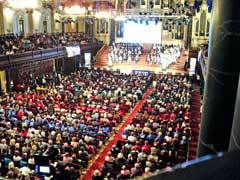 Representing over 500,000 people the coalition of community, religious and union groups includes the three Catholic dioceses of the Sydney area. 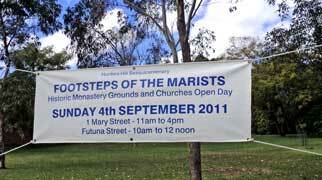 Two Marists are leaving Australia this week for international travel. Pictured left: Provincial, Fr Paul Cooney, farewells leader of the Marist community in Nara, Japan, Fr Keith Tulloch, after a short visit to Australia. Fr Paul himself leaves on Sep 14 for Rome and meetings of major superiors and the international finance committee of the Society of Mary of which he is the chairman. Beginning on Sep 12, the Feast of the Holy Name of Mary, Marists around the world have begun a year of revisiting and reflecting on their Constitutions. 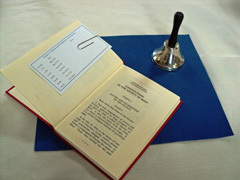 Twenty-five years ago, on Sep 12, 1987, the post-Vatican II constitutions were approved by the Holy See. Australian Marists have been encouraged to read one number of the rule each day at a community meal in conjunction with prayerful reflections using Fr Craig Larkin's 'Bearings'. 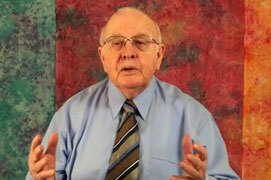 Fr John Thornhill's 'Emmaus series" theology lectures are now online. Emmaus colleague, Fr Patrick Lim, has made the popular series available on You Tube. DVDs have been available for some time. For the first of the series, "An introduction to Catholic theology", click here. 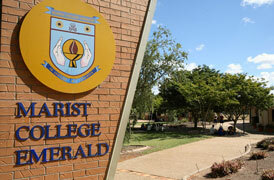 Members of the Marist Family gathered at Emerald, Central Queensland, on Sep 05 to farewell the Marist Brothers. 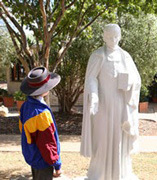 The Brothers established a Catholic secondary school at Emerald 16 years ago preparing it for eventual lay leadership and imbuing the college community with Marist ideals and spirit. 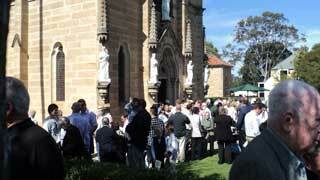 Marist priests and Missionary Sisters from Gladstone and Tannum Sands joined the Brothers for their farewell. Pictured, back from left: Br Bernard Yamaguchi FMS, Sr Margaret Gilbert SMSM, Br Mark Murphy FMS, Fr Bernard McFadyen SM, Br Gerry Steele FMS; front: Sr Noreen Dunne SMSM, Fr Stephen Hanley PP, Fr Paul Mahony SM / with Mrs Marie Martin, present college principal. 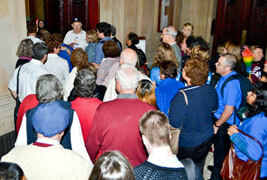 Hundreds of visitors and parishioners wandered the grounds, followed guided tours and inspected the uniquely historic buildings and precincts. 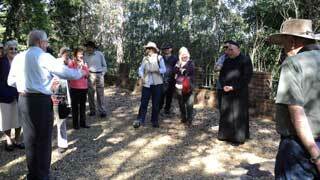 Local historian, Arthur Boyd, gave talks at both church centres, which were followed by inspections led by local guides and Marist residents of Villa Maria monastery. 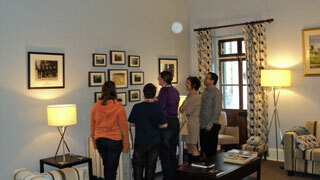 The Chapter Hall became a museum for the day while the monastery doors were opened for visitors to enjoy its fine Hawkesbury sandstone and historic photographs. The latest resource in promoting the Cause for Beatification of Marist Founder, Fr Jean-Claude Colin, can now be downloaded from this web site. The small leaflet has a short 200-word biography of Fr Colin, with the recently-produced icon on the cover and Beatification Prayer on the back. 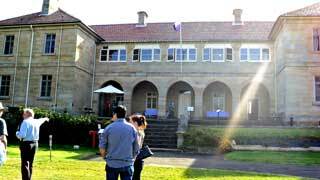 Thirty Marist priests and brothers are gathered at 'Maryvale', Hunters Hill, NSW, for the annual provincial retreat. 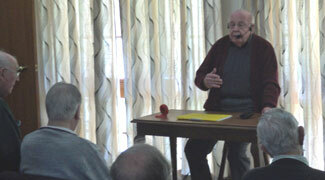 The retreat is being led by retired Marist theologian, Fr John Thornhill, and concludes on Sep 02.